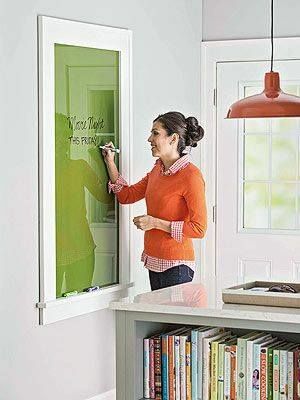 DIY Message Board - What a Great Idea! What a great idea for a DIY message board! It is attractive and, oh, so useful. It’s handy to have by the back door so everyone can see it as they come and go. But, it does work in various places in your home depending on it’s arrangement. It’s made from a piece of glass so you can write on it with a dry-erase marker and easily wipe it off. You get this effect by painting the back of the glass and framing it to look like a window. The green used in this DIY message board project matched a cabinet in the room. You can use the paint color of your choice. A big ‘Thank You’ goes out to Better Homes and Garden for this clever, useful message board idea! DIY Message Board Project – Useful and Attractive!